HomeGroup is a group of Windows devices and computers on a LAN or local network which can easily share printers and files. But, after the update of Windows 10 on 10th April 2018, Microsoft did not offer this feature any more. So, in recent days people have faced some problems when they want to share their printers and files as they couldn’t find this feature in Control Panel, File Explorer or Troubleshoot settings. But, on the other hand, Microsoft offers some top-notch built-in tools like OneDrive, Nearby Sharing, share and some other sharing features. If you face some problems like others when you try to share printers, files and folders, then don’t panic if you don’t find the HomeGroup feature to share the resources. 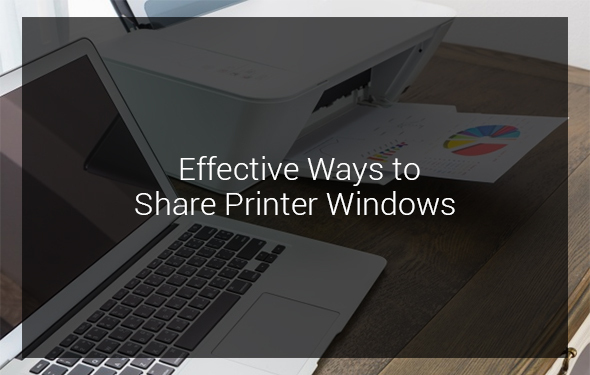 In this article, we are discussing the most effective methods to share printer Windows 10. If you are one of the among users who have faced this issue, just go through the whole article which surely helps you to share the resources. You can be able to share printer Windows 10 which is connected directly to your computer with your other devices just over a network. But, you can also share a USB printer on Windows 10 without this feature very easily. So if you have a printer or multifunction device with a built-in print server, it’s recommended to use that option instead. So, if you have no technical knowledge about share printer Windows 10, then don’t panic. Just follow the guideline instructed below to connect to the printer easily. Share Printer Windows 10 with the other Devices on the Local Network: Try Out the Steps! First of all, open the Settings option. After that, choose ‘Printers & scanners’. Under the ‘Printers & Scanners’ option, you can find a list of printers. Select the printer which you are willing to share. Now, tap on the Manage option. After that, you have to go to the Printer properties link. You will find the Sharing tab. Click on it. Now, you have to go to the ‘Share this printer’ option. At last, Click OK to share the printer. When you will complete all steps, then the last thing you have to do is to connect your all devices to your new shared printer over the local network. First of all, open the Settings. Then, choose the Devices option. You will find the ‘Printers & Scanners’ option. Select the ‘Add a printer or scanner’ option to add your printer. If you can be able to find your device automatically, click on the name of your device. Then, follow the instructions one by one which appears on the screen to install your printer. Otherwise, choose the ‘printer that I want isn’t listed’ link. Now, you have to go for the ‘Select a shared printer by name’ option. After that, click on the Browse option. Click on the ‘computer name sharing the printer’ option. Now, you have to choose the printer. Tap on the Next again. At last, choose the Finish. After finishing the whole process, you have to repeat all the instructions again for the remaining devices that will do the printing session to the same shared printer easily. If you use a device which is compatible with Windows 7, Windows 8.1 or an older version of Windows 10, then don’t waste your valuable time to think about it. Just go through this guideline and perform all the steps carefully. At first, go to the search box and open the Control panel. Now, go to the ‘View devices and printers’ option. You can find ‘Add a printer’. If you can find your device, click on it. Then, follow the instructions one by one which appears on the screen to install your printer. Otherwise, choose the ‘printer that I want isn’t listed’ link. Choose the ‘computer name sharing the printer’ option. After that, you have to choose the printer. When the ‘computer sharing the printer’ option is turned on and your devices are connected to the printer, then you can be able to print easily. If your preferred device is hibernating, asleep or off, you can not be able to connect. On Windows 10, you will have many options to share your files with other devices and people in multiple ways by using the OneDrive, Share functionality and the file sharing feature. First, type the Windows key and E key at the same time on the keyboard to invoke the File Explorer. Browse to the folder with files which you are willing to share. Select one or all the files by holding the combination of the Ctrl and A key. Now, go to the Share tab. After that, select the Share option. You can do it also by right-clicking on your preferred file, and then select the Share option which you will find in the context menu. Now, follow the instructions which appears on the screen to share the content. If you want to share your files with some nearby devices, then you need to check first that the Nearby sharing is configured and set up correctly both on your device and the destination device. On April 2018, Windows 10 update brings the new features of Nearby sharing. Basically, this feature is used to connect the bluetooth adapters with your device. You can come to know later about this feature in this share printer Windows 10 guide. First of all, invoke the File Explorer by using the combination of Windows key and E key on the keyboard. Now, find the OneDrive folder where the files which you are willing to share are stored. Then, click on the file and choose the ‘Share a OneDrive link’ option. After completing all the above steps, you can see that a unique link for your file will be created. Just copy this link to the clipboard. Click on the link and paste it. Now, send this link to the network users via online service, email or other messaging services available on the internet. Now, click on the file and choose the ‘More OneDrive sharing’ options. You can set the expiration date. You can be able to set the password. In social media services, you can easily share a link. You will be able to share a link via email. You can get a copy of the link. You can easily share and send your folders and all the files in it at a time like share printers Windows 10 by using the feature HomeGroup. But, this process is quite complicated. So, we provide a bit easy process for you to share the folders easily. Just go through this processes carefully. First of all, open the File Explorer by using the combination of Windows key and E key on the keyboard. Now, select the folder which you are willing to share. Click on the folder and choose the ‘Give access to’ option. Now, Choose the ‘Specific people’ option. Under the ‘Network access’ wizard, you can find a menu. Choose the users whom you want to share the folder from the drop-down menu. Individual user – If you choose an existing account, then the user has to give his password and username to access the contents of the folder. Otherwise, the user is logged in a completely different account of the same credentials on the other devices. Everyone – if you select this option, you can share the folders and files with anyone through the local network and if you want to access the files, you need not to put any password. You can able to find another option to create a completely new account, but this option will not work as now, this option doesn’t allow you to create a new and different account through the Control Panel after the recent update of Windows 10. This is a common issue which the users mostly deal with. So, Microsoft needs to resolve this soon. After that, click on the Add option. Read – Users can open and list files, but they can’t be deleted or modified with the existing folders and files in it. Also, they are not allowed to create or update new folders and files. Read/Write – Users can open, list, delete, modify, upload and create new files, contents and folders. Remove – This option allows nobody to access the folder and its content. 3. At last, select the Share button. After finishing all the above steps, this wizard will provide you the link by which the network users can access your files, folder and its content. When you share a folder and it’s content, remember that the network users can only be able to access your files if you turn on the Sharing and connected to the local network. If the unique link and the path of the shared folder are provided to you, then there are two ways to access this shared folder. First, you can do this by copying and pasting the link in the address bar of the File Explorer. Second, you can go to the exact folder by the ‘Network’ page which you can find in the left side of the File Explorer. If you still cannot access the shared folder and its content in the home network, then it might be an issue of the network. This problem occurs for changing your device name to an IP address. When the firewall blocks the path, then also this issue strikes. This is why we have a suggestion that you can solve it by changing your device name with the IP address of this shared folder. You can even find this option in the network adapter properties, which you will find under the ‘Network & security’ option of Settings. If you detect that the main problem is occured due to the firewall, then you can disable the firewall temporarily on both devices. First, go to the ‘Windows Defender Security Center’. Then, select the ‘Firewall & network protection’ option. Under this option, you will find the Settings option of the private network. Now, disable the ‘Windows Defender Firewall’. After disabling it, just try again to access the shared folder. If this issue still persists, you can resolve this error by clicking the ‘Allow an app’ option which you’ll find in the firewall link of the ‘Firewall & network protection’ page, and then check whether the ‘File and Printer Sharing’ option is turned on or not for Private network. If you used HomeGroup to share and access your folders and files before April 2018 Windows 10 update, your shared folders and its content are available to all the users even after upgrading to the latest version. Although, Windows 10 offers myriad of advanced settings and tools which you can configure to share your resources. 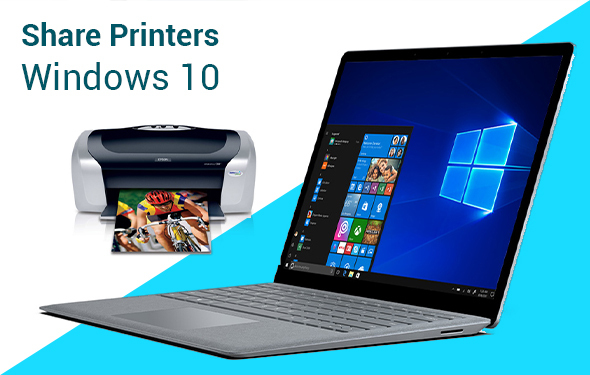 This shared printer Windows 10 article focuses everything about these in-built tools of windows which allows you to share files, folders and printers on Windows 10. 1.Can you share a USB printer? If the computers that need to share USB printers are connected to the same network, you can use the hub to connect the printers to a single computer on the network and use the network to share the printers among all the computers on the network. 2.How do you connect two laptops to one printer? Connect the printer to the peripheral switch using an A/B USB cable. Now, connect each computer to the peripheral switch using two A/B USB cables to make both connections. Connect the peripheral switch to power, if applicable. At last, turn on the printer and both PCs. 3.Can you print to a printer on a different network? 4.How do I access a network drive in Windows 10? First, press the Windows key and E key at the same time on the keyboard to open a File Explorer window. In Windows 10, choose ‘This PC’ from the left side of the window. After that, click the Computer tab. Now, click the Map Network Drive button. After that, choose a drive letter. Then, click the Browse button. At last, select a network computer or server, and then a shared folder. 5.What is file and printer sharing? File and printer sharing is an operational state in a computer that lets other users in the network to copy files and use the printer. Cybersecurity: can printers also be attacked by Malware? How to protect them?